According to archeologists, human occupation of the Helotes area dates to about 7000 years before present, when small bands of Nomadic Indians who migrated seasonally in search of food and game camped in this vicinity. 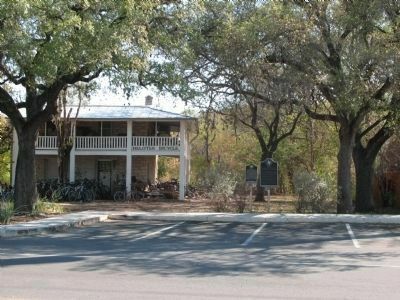 Early Texas Pioneer John M. Ross acquired title to the land here in 1836, purchasing rights to a Republic of Texas land grant from Almazon Huston, Quartermaster General of the Republic of Texas Army. In 1852 Ross sold the property to Thomas Devine and Francis Giraud, who formed a partnership to survey to land and sell it in smaller plots. 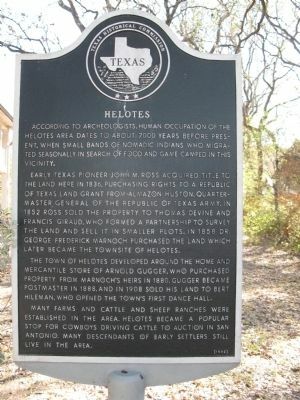 In 1858 Dr. George Frederick Marnoch purchased the land which later became the townsite of Helotes. The town of Helotes developed around the home and mercantile store of Arnold Gugger, who purchased property from Marnoch's heirs in 1880. Gugger became postmaster in 1888, and in 1908 sold his land to Bert Hielman, who opened the Town's first dance hall. Many farms and cattle and sheep ranches were established in the area. Helotes became a popular stop for a cowboys driving cattle to auction in San Antonio. Many descendants of early settlers still live in the area. Location. 29° 34.65′ N, 98° 41.42′ W. Marker is in Helotes, Texas, in Bexar County. Marker is on Old Bandera Road south of Floore Drive, on the right when traveling north. Touch for map. Marker is at or near this postal address: 14492 Old Bandera Rd, Helotes TX 78023, United States of America. Touch for directions. Other nearby markers. At least 8 other markers are within 14 miles of this marker, measured as the crow flies. Cascade Cavern (approx. 12.9 miles away); C-121 "Constellation" (approx. 13½ miles away); MTI Monument (approx. 13.6 miles away); OCS Class 62-A (approx. 13.8 miles away); Order of Daedalians / Fighter Aces Association (approx. 13.8 miles away); One More Roll (approx. 13.8 miles away); Aviation Cadets (approx. 13.8 miles away); USAF Officer Candidate School (approx. 13.8 miles away). More. Search the internet for Helotes. Credits. This page was last revised on June 16, 2016. This page originally submitted on September 7, 2011, by Richard Denney of Austin, Texas. This page has been viewed 1,575 times since then and 25 times this year. Photos: 1, 2, 3, 4. submitted on September 7, 2011, by Richard Denney of Austin, Texas. • Bernard Fisher was the editor who published this page.